Aquarius is the sign of groups, friendship and humanitarian pursuits. Connecting with a partner on the mental plane is far more important for Aquarius beings than seeing them in the flesh every day. A she-Aquarius has a cool social ease, and she loves her freedom to bits. Her contact list is often full with an eclectic mix of characters. Known to look beyond labels, she would date across the age, race and culture spectrum. But, she likes to be friends first, and stay that way, no matter what. This girl can bring so much fun, creativity and whackiness to a relationship. Her strength of individuality shines through in any conversation. She prides herself on being a progressive thinker, and loves a thorough challenge; she can be a maddening debater. The female Water-bearer is quite unpredictable, intelligent and astute. A keen observer, she loves originality in her men. She likes being in touch with her mate/s via gizmos and modern communication systems. Yet, being sure that she is in love can be tricky. She may be engrossed in an intimate chat with a friend a moment, and the next, she may pull away – her line disconnected, her phone unreachable. To love an Aquarius woman will be a challenge to you if you feel uneasy with signs of independence, or that she has a mind of her own, in your woman. If she exhibits devotion to you and any family you and she have, then this is probably a result of an intellectual conviction that she has, a strong belief that such commitment is an ideal, rather than due to an emotional commitment (other features of her birth chart may modify this). It is just as likely that she will seek an outlet for her idealism in the outside world than within the confines of the home, and therefore you would be unwise to try and limit her movements - which is not to say you may not ask her to consider whether her ideals are so impractical that they will never make the world a better place. 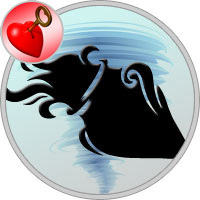 Even if she does make a commitment to home life, an Aquarius woman is almost certainly building up frustration within her if she does not have some interest outside. This could well be the promotion of a cause or ideal in association with a group of like-minded people. Within the home she is likely, as soon as it is feasible if not before, to treat her offspring as friends rather than as children, encouraging independence and a sense of adventure. In your personal relationship your Aquarius woman may come across as emotionally cool at the same time as exhibiting feminine charms. She does have emotions but she may be rather frightened of them, and this can lead to their repression into the unconscious, or to an enthusiastic but shallow expression of them, so that you do not enjoy the intimacy that you could have if she allowed herself to feel deeply and share with you on that level. If you want to enjoy greater love and intimacy, try and catch the moments when she contacts deeper feelings and enter into empathy with her at those times, encouraging her to stay in touch with those feeling whether they are pleasant or otherwise.